Summer has been pretty mild, as far as heat, here in the Northeast. I don’t go anywhere without my sweater, and that’s not for the air conditioning! Mind you, I’m not complaining! I love pulling up the extra blanket at night and leaving the windows open. Even so, I have not been in the mood for baked casseroles. They just scream “end of summer!” and I haven’t been ready for that. However, seeing as it’s Labor Day and I was ready for something more like comfort food, I fell in love with this casserole recipe. 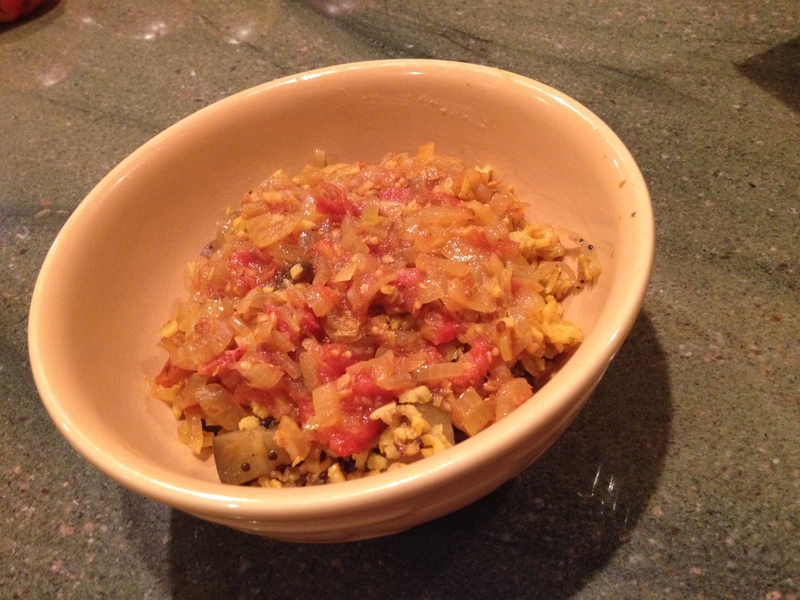 It also played into my love of Indian food and used my fresh garden eggplant. This recipe comes from The Complete Vegetarian Cuisine by Rose Elliot so I won’t plagiarize and write the whole recipe here. That would be unethical. However, I will give you the basic idea and you can probably “wing it” because from my quick internet search, biriyanis are Indian soul food with many different types of recipes. The basic idea is cooking rice and adding slow cooked vegetables that you put together and bake. 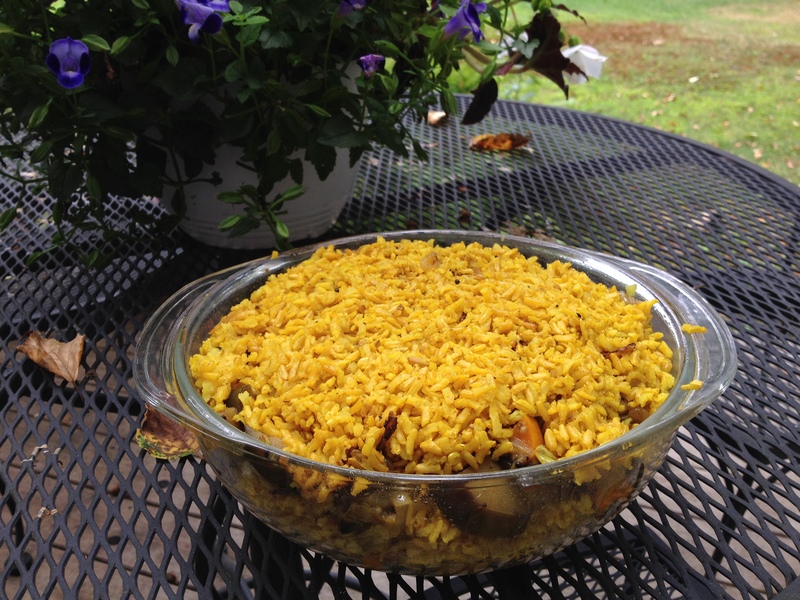 For mine, I cooked brown basmati rice (because that’s what I have on hand) with turmeric. Then I slowly cooked, in an open fry pan, the ghee with the spices, adding the vegetables after the spices were melded and fragrant. For the spices, I highly recommend keeping whole spices on hand and grinding as needed. They stay fresh and flavorful that way. Jim was kind enough to lend his hand with mortar and pestle duty as there were a lot of spices to prepare. I used a mixture of fresh garlic and ginger, with coriander, cumin and cardamom seeds. The eggplant was fresh from the garden, as were the tomatoes for the curry sauce. Layer the rice and vegetables in the covered casserole dish and cook in a moderate oven until heated through – approximately 30 minutes. The curry sauce was the perfect topping! Heat oil in a fry pan on medium low heat. Add minced fresh garlic (5 cloves), ginger (1/2 inch), and onions (one large whole) along with mustard seeds, coriander, cumin, and turmeric (2 tsp each). The amounts are approximate, please adjust to your liking. Mine was pretty spicy. When the onion is translucent, add a large whole fresh tomato, chopped and some vegetable broth. The amount of broth depends on how thick you want it. I only added one cup and I did not blend the sauce, though that is an option for you. * helpful hint: Have some plain yogurt for a side dish. This is helpful when the dish comes out spicier than you intended as it cools the spiciness.